Everyone will need a plumber at some point in time. The best time to choose a licensed plumber is before you need one. Licensed plumbers are certified after they take a test which checks their ability to solve plumbing problems and retain important safety information. Making a good decision will help you prevent a panic situation in an emergency or making a hasty decision for an under qualified plumber. It pays to be prepared for emergency house repairs such as a clogged drain or a burst pipe. Most people don’t think about the plumbing in their homes or plumbers until there’s a problem. At that point we pull out the yellow pages and start calling, until someone answers. That’s not a good way to choose a professional in any field, especially in Aspen! Here’s a quick guide to selecting a good, reliable, fairly priced plumber when you’re not in a crisis. A good plumber will have insurance, in case of accident, such as accidentally soldering a pipe which sets your carpet on fire. It’s okay to ask a plumber or plumbing company for the name of their insurance company, their policy number, and for you to check that the policy is active before you allow the plumber to work on your house. 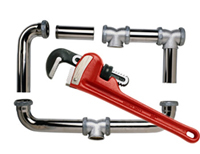 A good plumber will have excellent emergency response time, 24 hour service, and service on holidays. Ask them what their emergency response time is. If it’s more than 3 hours it’s not really useful in most plumbing emergencies. While these services at odd hours or in emergencies may cost more, you want and need a relationship with an established and reliable plumber that will serve you and your family whenever the need arises. Ask them if they work New Year’s Day and Christmas Day? The answer to this question will tell you a lot about the plumber and plumbing company you are considering. At the end of the day, nothing beats the real world experience of a good, qualified plumber. Find out how long the plumber has been in business and double check what they tell you with the secretary of state’s office if you feel the need to double check conflicting answers from staff, or that you find published on their website. Nothing beats experience. Not price. Not response time. Experienced plumbers will have a reputation for doing good business with your friends and neighbors. Ask them what they think about the plumber you are considering. Ask for references and check them out. Before a plumber starts work on a project, you should have a signed work order that outlines the total cost, the hourly rate, and the hours estimated for the job. The work order should describe the work to be done, the start date, estimated completion date, and the materials to be used and their itemized costs. Bishop Plumbing, Heating & Air Conditioning would be honored if you would consider our licensed and knowledgeable plumbers for your Vail or Aspen home. Standard Tank Type Water Heaters – Conventional tank type water heaters offered in sizes from 20 gallon to 120 gallon capacity, fueled by electric or gas. Energy Efficiency ratings starting at .58 and higher for Gas models and .85 and higher for electric models. Tankless Type Water Heaters – Tankless Type Water Heaters offered in sizes for one fixture, complete homes, or commercial applications, fueled by electric or gas.